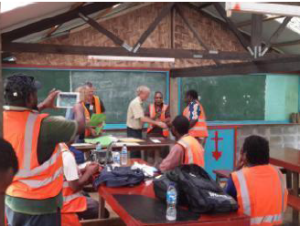 Our Tasmanian Committee has supported training for a team of scientists and foresters from Papua New Guinea (PNG) and Australia to run a ‘train the trainer’ course for foresters and landowners in Lae, Papua New Guinea. 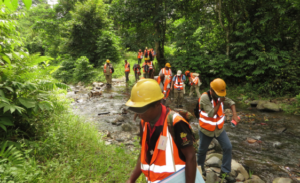 The aim of this project was to strengthen the knowledge and skills of PNG foresters, managers and landowners in sustainable logging for biodiversity conservation and their ability to train others in this area. 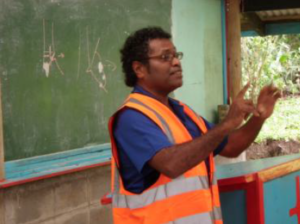 During the course, a training module was developed which means that there should now be expertise within PNG to repeat this course as required. The six day course delivered training to 52 course participants, including PNG government staff, industry staff and landowners. Landowners from the Oomsis area provided their local knowledge of biodiversity values and in return learnt about why it is important to conserve such values for the ongoing health and productivity of their forests. They were also introduced to monitoring methods. A module on the management of biodiversity values was delivered as part of this course with the support of the Crawford Fund. Biodiversity conservation in the privately owned forests of Papua New Guinea is important for the health of the forests and sustainability of the subsistence gardens on which the local people depend. Around two days in total were spent on the biodiversity module. Theory sessions were held at the PNG Forest Research Institute (PNGFRI) in Lae and field sessions were conducted at the Oomsis forest area. Presenters included PNG and Australian biologists and foresters. Information was delivered using a variety of approaches to cater for different learning styles. “There is potential for a further small project to translate the main guidelines and course content into Tok Pisin (pidgin) for use by forest workers at the local level,’ reports Neville Mendham, Coordinator of the Tasmanian Committee. Further work is planned for the development of a plantation code of practice incorporating provisions for the maintenance of water quality, biodiversity conservation and forest productivity.